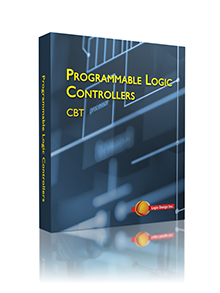 This highly innovative computer-based training (CBT) program combines advanced PLC simulation with one of the best-selling PLC books in history. Students learn the Logix 5000 PLC system – the industry standard with over 80% of the U.S. PLC market. This CBT learning program includes 19 interactive modules to help learners gain an in-depth understanding of PLCs and their applications in industry. The PLC CBT consists of 19 modules of interactive curriculum using text, video, audio, 2D and 3D animations and laboratory simulation software. This USB-based multimedia program includes pre-tests, interactive exercises and sample exams. The PLC CBT prepares graduates of the program for employment and/or further on-the-job training as a PLC technician in the field of consumer, commercial and industrial electronics. As well, it will enable students to provide technical support and service during the production, installation, operation and repair of PLC equipment and systems. The following links provide you with detailed descriptions of the modules contained in the Programmable Logic Controllers CBT. This module is intended to familiarize the student with the most important aspects of the PLC's central processing unit. Topics covered in the module include memory devices and memory storage, as well as an introduction to data storage and processing. In addition to covering memory utilization and memory mapping, the module also provides detailed information on multiprocessing and PLC scan functions. This module covers all aspects of the Input/Output system for PLCs including discrete, analog, and data I/O. In addition, the module also presents an overview of I/O addressing and an introduction to Allen-Bradley I/O parameters. Course topics also include the principles of remote I/O and an introduction to scaling and resolution of analog devices and signals. This module is intended to provide students with an overview of the wide range of programming terminals currently in use and to outline some of the key differences between them. In addition, the module covers topics such as hand-held programming terminals and computer-based software packages. The operation of host computer-based systems is also covered as well as the application of peripheral devices in a PLC network. The purpose of this module is to provide the student with a thorough coverage of the various safety precautions, preventative maintenance, and troubleshooting techniques associated with a typical PLC system. In addition, the module also covers proper grounding techniques, sources of electrical interference, and I/O installation techniques. Field checkout and troubleshooting with an emphasis on practical troubleshooting and problem-solving strategies. This module is intended to provide an introduction to relay logic and relay logic diagrams. The basic operating principles of relays are presented as well as detailed information regarding sizing and rating of electromagnetic contactors. Seal-in circuits and their application in control systems is discussed as well as an introduction to timing circuits. In addition, the module covers I/O devices and their application in PLC systems. This module provides an introduction to ladder logic programming techniques using laboratory simulation software. The lab component of the module provides the student with an opportunity to write ladder logic programs and test their operation through PLC simulation. Topics covered in the module include I/O instructions, safety circuitry, programming restrictions, and I/O addressing. Define the terms examine on and examine off'. This module is intended to provide students with an overview of PLC timers and their application in industrial control circuits. 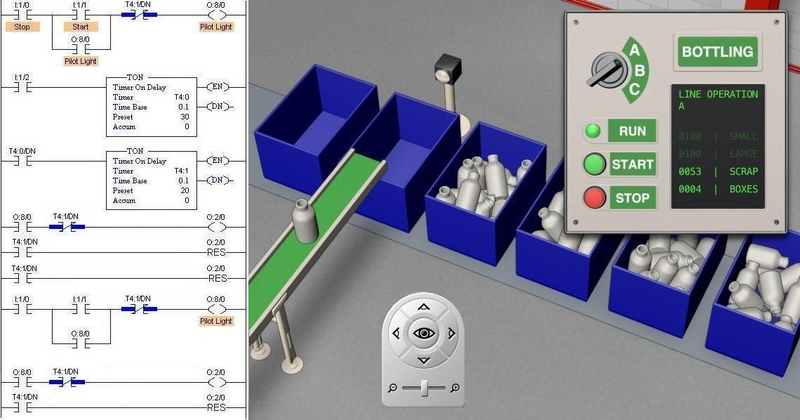 Allen-Bradley timing functions such as TON, TOF, and RTO are discussed in detail and the theory is reinforced through lab projects using lab simulation software. In addition, students will learn practical programming techniques for timers including cascading and reciprocating timing circuits. This module is intended to provide an overview of various zone control techniques and branching instructions. The principles of Master Control Relays are presented with an emphasis on safety considerations and compliance with safety codes and regulations. In addition, the module also provides coverage of subroutines and their application and benefit in complex control problems. Force instructions are presented and demonstrated through lab simulation software. The simulation software also allows the student to program and observe branching operations. This module is designed to provide the student with a clear understanding of the purpose and application of PLC sequencers, both through the theory of operation and through the actual demonstration using lab simulation software. The module will familiarize the learner with masking techniques and the various types of sequencers available including SQO and SQC instructions. In addition, sequencers charts are presented with an emphasis on maintenance and recording of sequencer chart information. This module provides students with an introduction to the principles of data transfer, including bits, words, and files. Using lab simulation, various aspects of data transfer will be demonstrated and students will program and observe transfer instructions such as MOV. An introduction to shift registers is also presented with an emphasis on practical application in industrial control circuits. This module provides an overview of basic mathematical functions found in typical PLCs. It also provides thorough coverage of data comparison instructions such as EQU, LES, and GRT. In addition, this module provides a foundation for more advanced programming techniques including analog input and output control. Topics such as combining math functions are presented with an emphasis on practical application and are demonstrated through lab simulation. The purpose of this module is to provide the student with a thorough understanding of the various aspects of process control and its application to PLC systems. In addition to open-loop and closed-loop systems, the module also covers advanced closed loop techniques including PID control. Analog I/O devices are presented in detail and tuning parameters for PID control systems is demonstrated through practical examples. This module is intended to provide the student with an introduction to networking using PLC systems and peripherals. The principles of data highways are discussed using windows platform and Allen-Bradley hardware and programming software. In addition, an introduction to ethernet and network switching is also presented as well as detailed descriptions of topology and the application of token passing in a data highway. The module also provides an overview of transmission media including fiber optic, coaxial, and twisted pair cable. This module is designed to provide the student with a thorough understanding of the various number systems used by PLCs and their application in industrial control. The module covers binary numbers and codes including BCD, Octal, and hexadecimal. In addition, the module also demonstrates through lab simulation how number systems are manipulated by the PLC's processor. Topics also covered in the module include negative binary numbers, parity bit, Gray code, and ASCII. This module provides a thorough treatment of digital logic and its application in PLC programming and control. Boolean algebra and the theorems associated with it are presented and demonstrated through a series of programming examples. In addition, the student will become adept at converting digital logic to ladder logic and will apply DeMorgan's theorem to increase circuit efficiency and reduce redundency.